BedRock-The Band in the Sand - Home Page. Hi there, folks! Well, Kenny and yours truly survived the German Carnival in Luderitz last night - just!! It was a great evening so thanks to all the people involved in LUKA and, of course, the Buchters for their attendance. Good one! Watch this space! Well this is a first for your scribe - sitting in an Internet Cafe in the Atrium Centre in Claremont, Cape Town, updating your favourite site. Bedrock had an unexpected "big punt" last Wednesday (14 August) when "Recovery" was featured on SAfm's Bruce Millar show. Steve Segermann, editor of the SA Rock Digest, spoke eloquently - and humourously - about the band's latest release giving it a very positive spin. The show's presenter, Bruce Millar, rued the fact that he didn't have a CD to play and so, true to bedrock form, one was couriered off to him at haste! So, standby for next week's Bruce Millar shows, especially Wednesday's edition when he seems to focus on local rock happenings. To our Capetonian friends, "Recovery" is now available from Avatar Music in the Riverside Centre at Rondebosch. If you can't find it on the shelves speak to Jim who will arrange a copy for you. Your scribe (as usual) has taken in loads of musical happenings this week including "Five Of A Kind" at the Green Dolphin, Dorp Street Theatre Cafe and the Blue Ivory Jazz Lounge, both of the latter being out at Stellenbosch. Also enjoyed were "Vic's Jazz Band" at the Wipeout Bar at Muizenberg and, tonight, it's "Glory Days" at On Broadway. Tomorrow I'll be back on the road for good old Oranjemund. Chat to you then. Don't forget to get your copy of "Recovery" and please play it loud enough to disturb the neioghbours. Surely this is what a democraxctic society is about - sharing our privileges? Good One! The "Recovery" CD sales are going from strength to strength and it is anticipated that the disk is getting airtime on Windhoek's Radio Kudu and Radio Wave 96.7 FM. The release has also received an honourable mention or two on the SA ROCK DIGEST website (www.cd.co.za). For our Windhoek friends who would like to buy locally, the CD may be purchased at Take Note and Universal Sounds, both in Independence Avenue. For those who wish to use mail order, you may do so through this website or OneWorld which has a link from the SA ROCK DIGEST site. The day started on a very positive footing with the dawn bringing a windless, cloudless and sunny day with it. The band members and their families made a leisurely start to their day, before all meeting up at the local Bowling Club for a champagne breakfast. Good idea this, Bowling Club - let's do it more often. After a hearty breakfast the guys moved on to load up, and set up, at our most favourite of local venues, "La Cantina" - or "The Don" as it is more commonly known. It was such a pleasure being back there again although the pessimists amongst us had wondered just what sort of crowd we'd draw, with many of our usual groupies - the hockey and golf club crowds - being away on sports weekends. As it transpired, the attendance was even beyond the optimists' expectations! We kicked off our first set with a nice and gentle blues tune, "Red House", before picking up the pace a bit. Right from the outset it was clear that the contest for the "Party Animal Of The Day Award" would be a fierce one, the early trendsetter being Marie (no surnames...you all know who she is!). Her performance was impressive as she continued as she started out, throwing down the gauntlet to all-comers. Thanks to Marie's efforts, the dancing started early! People flowed in (as did the alcohol!) throughout the afternoon and we soon realised that we were onto a "winner". Especially pleasing to see were the number of old, as well as new, faces that popped in. There were folk from Port Nolloth, Alexander Bay and Kleinzee, turning yet another Bedrock gig into an international event. I mean, how many other bands can say that their audiences are drawn from beyond their borders every time they play? C'mon, is this for real or what! Our old mate Hennie kept the band well "fed" with a steady flow of pumpelmussen, ensuring that the party spirit didn't fade away. The dancers grew in number and, soon, we had young and old alike bopping away. The vibe was brilliant. On and on played the band, churning out four sets in all. At last the "Party Animal Award" presentation arrived and, in the main category, there could only have been one winner...you guessed it - Marie. Well done, Marie, and we hope that you'll be back to defend your title! Such was the occasion that it was deemed appropriate to present a second "award". This one was for "spirit" and was duly presented to one of the town's most favourite former residents, Kotie Reid. Well done, Kotie - you certainly showed the young crowd that you can still keep up with the best! Enjoy the schnapps and we look forward to that gig down Darling way. To the rest of you - thanks hugely for your presence...this was definitely one of the best gigs we've ever played at "The Don" and you made it. The band will be going into recess for a few weeks now whilst Mike goes off to continue his studies down at Rhodes University. Hopefully that beautiful area will inspire him into writing some great original songs in his spare time! The rest of us will also be working on original material for our next CD, whenever that may be. Kenny and Pete will be performing as a two piece at the German Carnival in Luderitz on 01 September so, if any of you are down that way, get yourself a ticket and join the fun. This is one event of the year on the Luderitz calendar that should not be missed. 'Til next time - look after yourselves, keep rockin' & boppin' and remember the immortal words of ZZ Top's Billy Gibbons - "Life's too short for bad tone". The long-awaited day finally arrived and Shout & Ramage (sounds like a type of bottled sauce, doesn't it?) took a day's leave - with alacrity - and took up position at the Bowling Club awaiting the arrival of the stage. (Stage? What's that I hear you say. Ah-hah...this time Bedrock would literally be "head and shoulders" above the rest!). Almost to the minute the truck arrived and Ramage leapt into foreman mode, gesticulating here, there and everywhere, all the while barking (he is a bit of a dog!) directions. The lack of authority in his manner and voice immediately manifested themselves, the truck's crew contemptuously tossing the stage overboard and driving off! The duo looked at the expansive pieces of wood rather forlornly wondering how they would get from where they lay, to where they would be of some use. Once again Ramage took charge, bristling with authority as he press-ganged a group of bemused onlookers into helping. With a few heaves and ho's (plus many "Ouch my back" pleas) the stages were carefully eased into the clubhouse, positioned, carpeted and declared open for business. All morning the duo toiled away until joined by Mike & Eddie after lunch. Soundcheck time. All went well. Then it was time for a short break before the festivities began. Pete & Eddie headed for the Hockey Club to be present at their Big Raffle Draw, hoping to come away with a trolley-full of cash. No chance. Still, they rationalised, you can't have everything...I mean, being in Bedrock surely has no value anyway? Or should that be "No price"? Ag, who cares. Back at the Bowling Club an expectant crowd was rapidly building and the CD sales were surging. After playing the cool rock star geriatrics for a while it was time to play. Up Eddie went and opened the set on the drums with the start to Grand Funk Railroad's "Some Kind Of Wonderful". Soon the whole band was up there, rocking into the evening. Also new were the band's newly acquired lighting "trees", including a mirror ball, strobe and a few other "tricks". The audience were clearly on their way to being inebriated as they immediately filled the dance floor, determined to make the most of the night. Tirelessly the band ran through the play list, past the first set and into the second. Then the really big moment arrived - the German television crew made their entrance. Yes, folks, Bedrock will be appearing in a German-French television documentary which is presently being shot - on location, you understand - and which features our little community and its mining activities. Seemingly mesmerised by Bedrock's uniqueness, the television crew were leaden-footed when it came to moving away from the stage. Shout & Ramage revelled in the opportunity to perform in front of the cameras, duly attracting the producer's rebuke for going "over the top". (Sorry boss - shall we...err...shoot that scene again?). As a result, the whole of Europe will be left with the totally false impression that Bedrock act their age. What an appalling notion! At 01:00 the band ended their final set, beating the local Constabulary at their own game. You see when the "Quick Response" unit of the Cops arrived at the Club two hours later the noise levels were perfect. But we have a fairly intrepid bunch of local Coppers and, having spoilt their night's sleep getting up so early anyway, they positioned themselves in the shadows outside the club to see if they could get themselves a drunken driver or two. Sorry Officers, Bedrock don't have those kinds of supporters - they're actually wiser than that. Our mob just stay safely tucked away inside the clubhouse and carry on drinking until they fall over where they stand, or the Cops go to bed again! Needless to say, Pete, Mike & Eddie, being the ages they are, retired to bed before the night got any later, leaving Kenny to "carry the flag" for the band. That was extremely noble of him but he stuck to the task manfully until well after dawn. Kenny, you see, has very poor night vision so he couldn't strike for home because he couldn't see his way without daylight. Good on yer, Kennuf. Anyway, another glorious night in the band's history passed by and, if you haven't had enough, we'll be doing our thing again at 'La Cantina' (The Don) on Saturday, 4 August. Hopefully we'll see you all there. Chow for now. Don't forget the release of BedRock's new CD "Recovery" on the 29th June 2001. Hey, check out Eddie's new kit!! Well us lucky people here in Namibia are enjoying the first of two public holidays. Today's Ascension Day and tomorrow's Africa Day and, not wishing to be "sticks in the mud", we'll drink to both! Sorry to sound irreverent. Anyway, for most people these two days probably spell holiday time but not so for this hardworking band of ours. Ah...correction...we must admit that young Michael has taken himself off oevrseas for a couple of weeks. That leaves the three "home birds" behind. And just what are they up to? Lazing around drinking copious quantities of water & hops? Parking off? Chilling out? No Ways! The trio are hard at it churning out more material for the band. Today we had a healthy three hour session, sketching out a number of new songs icnluding a great rocker from Ramage. Whilst all this is going on, the CDs have arrived from the manufacturer and all that's awaited now are the covers and inserts. Exciting times! The launch is scheduled for Friday, 29 June, and all you folk who placed advanced orders can expect your purchases to be in the post by then. Enjoy! Just a quick note to let you all know about the new additions to this site. We've posted a few sample MP3 files from our new CD Recovery. They are available for download,on our MP3 page. We've also posted the Lyrics from all the songs on Recovery. You can find them on our Lyrics page. That's all for now folks. Now I'll hand you back to Pete Nut. After weeks of seclusion in Dining Room Studios it was great to get back out "on the road again" today. After two days of rain the skies cleared and a beautifully sunny, windless, day settled upon the village. With most of the Super 12 rugby games out of the way this morning, it was opportune for the sports' couch potatoes to lift themselves and plod over to the Don. We kicked off very gently, knowing that there had been quite a "pull-through" the previous night with the pub...well...closing its doors on the verge of sunrise! Can anyone believe how considerate and caring we are? As the afternoon progressed, so did we! Our second set was more lively and the third, well, it was the usual Bedrock mayhem!! With plenty of enthusiastic participants from the audience willing to join us upfront, the vibe of "participation" was quickly established. As the sun set and the day crept into darkness we did our encore numbers and put the afternoon to rest. A very pleasant day was had by all, we trust. The nice thing from Bedrock's point of view, is that we had our best attendance of the four gigs we have played so far this year. Thanks, folks, you know how much we value your support. Just to keep things exciting, we have a few more things in the mix coming up...or being formulated. Things like the CD launch which should be a real "jol". Then we're toying with the idea of a giant (by Oranjemund standards), all night rock 'n roll party at the town's most prestiguous residence and, something else to look forward to, will be Eddie's debut on his home-made drum kit. That should be good. He says it'll help him play "softer" - why anyone would want to do that is beyond us but let's not forget that Eddie's a drummer...and drummers...well.. Only kidding. We all love the guy, don't we? Anyhow, that's it for now, chat soon. Keep rockin'!! Well, after many weeks of recording, editing, mixing and mastering, the task has been completed and our next CD, "Recovery", is on its way. And, boy, did we put a lot of effort into this one. Incorporating all the lessons learnt in the production of our first CD in 2000, "La Cantina", we strived for perfection in every aspect. This extended from the selection of the fourteen original songs we wrote for the album, to the actual technical production. Over a seven week period we spent about 62 hours actually recording the material, followed by 30 hours of editing and approximately 35 hours of mixing and mastering. At least! This gives a total of well over 120 hours of effort for an unassuming garage band. Not bad when it comes to dedication, is it? The fourteen tracks which will appear on the CD are a super mix of the band's influences, both personally and collectively, with their wit and sense of humour shining through on many of the tracks. A wide spectrum of music is also evident, from 12 bar-based material to straight rock and moody jazz to simple pop. There are "stops" along the way with an instrumental number, as well as an unplugged one. As far as the song credits go, there are ten compositions from the prolific pen of axeman Kenny, two from bassman Pete and one each from Mike and departed Bedrock founder member, Pete Krog. There are also a couple of surprises which will be kept under wraps until the CD has been released! At present our CD manufacturers are cutting the CDs for us in Pretoria, whilst our design and artwork people are busy down Cape Town way. The CD will be accompanied by a twelve page booklet which will include all the song lyrics, as well as general band info. It is anticipated that "Recovery" will be available from about 15 May 2001. So, if you'd like to be one of the first to own this prestigous release, please let us know at bassman8655@hotmail.com. (By the way, the CD will be released with the necessary "pomp & circumstance" so watch this space for details!!). Hi folks - just a quick update on where we're at presently. Well, we have been in the recording studio for just more than forty hours to date. Yep, that's right - forty hours. All-in-all it has gone incredibly well, and the lessons learnt from the preparation of our first CD have been invaluable this time around. The new release will probably have thirteen tracks on it, all of them written by the band members. Having said this, Kenny's compositions dominate purely and simply because he hasn't got a job! Well...not a real one at any rate. I mean, just take a look at his CV - honestly, who would want to pay for those "skills"? Seriously, though, Pete and Mike have both chipped in and, technically, the quality of the recordings are fantastic. This is largely due to the effort Kenny has made in talking to Roland to fully understand their technology, the "Japanese-English" instruction manuals being a guaranteed way of destroying enthusiasm! Oh, sorry, I've missed out a chunk here - you see, Bedrock do all their recording on the incredible Roland VS1680 digital workstation. It's an amazing piece of technology and is recommended for any garage band who can't, or isn't prepared to, fork out for genuine studio time. Take it from us, if you know what you're doing, only the professional sound engineer or producer will tell the difference. Anyway, to recap, twelve of thirteen tracks are virtually complete and the master copy will be going off to the manufacturers' early in April. We're all very excited about this so stick around and follow the saga with us. Okay, okay, I can hear you lot out there all moaning and groaning because you think I've "timed out" and am not maintaining the diary as expeditiously as possible. Truth is, the bleeding server we are forced to deal with (through?) has been less than obliging of late. In fact, just tring to get in has been a "mission" of considerable effort. Just goes to show, even modern technology can't beat old fashioned time delays!! Still, a bitlate I know, but we're on-line again now. Well, last Friday (02 March) didn't go off too badly. It was, you recall, the band's farewell to our long-time loyal supporter and friend, Charl. (Sorry, girls, no more information than that - as a totally available single man he has enough hassles evading the mobs already, without adding fans to the list!). The weather was brilliant and matters had been well attended to, from the braai fire, to the stocking of the pub, to the control of the door. In short, all the ingredients were there but, for some reason, the attendance was less than we had anticipated. (Always seems to happen when people hear Bedrock are playing! Nah, just joking...aren't I?) Still, we got into the hectic stuff right from the outset, launching the evening with "Rockin' All Over The World". And that's, basically, the way we kept it. Charl, of course, couldn't resist the temptation to make yet another farewell speech. Actually, to be fair to him, the opportunity was presented to him on a platter after our favourite thespian, dear Yzelle 'O', insisted on making her own speech to pay due to his acting talents. Once that was over we were able to get back to the main activities of the evening. Anyway, Charl, thanks for all the huge support over the years and best wishes for the future. If you ever feel like have a party and want to invest in some dinosaurs, give us a call! So, how was Luderitz? You know - that's a really good question...seeing as how we didn't even get there! Ja, can you believe it? The "Band In The Sand" were made redundant before they even put one wheel on the road to the North. Not serious. You see, our hostess, Simone, had apparently done all that she could to make the night happen but, such was the demand, she couldn't find a venue bigger enough - at such short notice - to accommodate us. Well...that's our story and we're sticking to it! Actually the truth is that someone declared this weekend "Misery Weekend" in Luderitz & everyone was forbidden from having fun so we had to stay at home. No matter - home was quite fun. To tell you the truth, the postponement of our Luderitz gig came as a "blessing in disguise". The point is, it allowed us to get into the studio for two days to start preparing the material for our next CD and, I tell you what, things went really well. 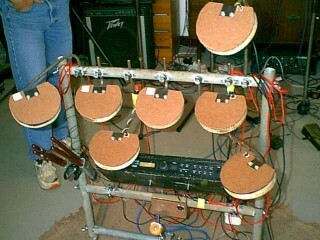 Sticks-man Eddie got very smart by borrowing local musician, Rian Du Plooy's, electronic drum kit. Nice one, Eddie. And I tell you what - where's Eddie as I don't want im to overhear this? - the kit's almost made him sound like a drummer! Incredible! Two hours it took us to get the electronic drum sorted and then - Whamo! - we were on the way. During the course of the weekend we have laid down twelve of our original tracks and will be completing that task tomorrow night, making fourteen tracks (at least) on the CD. Very exciting, actually, seeing as how it's all our own work. Most of the stuff we have been playing in public but there are a few surprises too. Best of all is that we can put what we like on there - there's none of this rap from producers and so on about "formulas" and "what's right or wrong". We're gonna put on what we feel like and stuff the rest! Hope you guys are ready for a really enjoyable light rock/pop/bluesy/country CD. It's started off with an incredibly good feel and let's hope that's the way it ends off. Until next time - keep boogin!